Our dynamic economy is characterized by constant change. New products are brought to market, achieve commercial success, and then are made obsolete by something better, faster, cheaper. An essential element in successful product creation is manufacturing plan verification. A manufacturing plan is a comprehensive compilation of all the facts, figures, and assumptions around making something of commercial value. A plant layout is necessary but not sufficient. How fast must each machine operate? What are the quality requirements? What are the optimum inventory levels? What is the annual volume for these things? How much money is available for investment? What is the unit cost target? 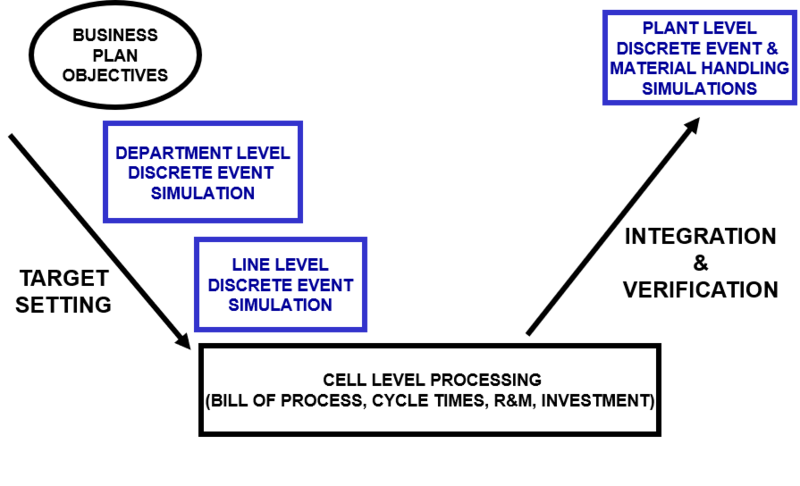 A manufacturing plan describes a long chain of events from order to delivery. It is not just enough to get each link in the chain to work. The entire system of links must work in harmony to deliver business plan operational and financial metrics. This is not easy to accomplish. Manufacturing plan verification manages this risk. A robust manufacturing plan starts with business plan objectives which are cascaded down into plant department performance targets through a high-level discrete event simulation model. Next, department performance targets are cascaded down into line level performance targets through a more detailed, line-level discrete event simulation model. With performance targets in hand, manufacturing teams can confidently do the detailed processing of their link in the chain. Systemic risk has been minimized if not eliminated totally: if each link meets its target, then the chain will work as expected. Manufacturing teams may be working remotely but they are not working in isolation…they are connected through the line-level discrete event simulation. Before program approval, each manufacturing team reports back on their performance predictions for its link in the chain. These values replace the targets in an integrated discrete event simulation model of the entire manufacturing process. The manufacturing plan is verified when this integrated model meets or exceeds business plan objectives. In addition to verifying production flows through discrete event simulation, material handling simulation models are often utilized prior to program approval to predict and optimize fork lift requirements, traffic flows and congestion, and indirect labor requirements. Does simulation lead manufacturing planning or vice versa? A little of both, in a collaborative Plan-Do-Check-Act continuous improvement cycle.